West Virginia, Feb. 13: A federal appeals court in Charleston, West Virginia, has ruled that the US Army Corps of Engineers may permit coal companies involved in the controversial and environmentally destructive practice of “Mountaintop Removal” mining to bypass the Clean Water Act rules in its permitting process. 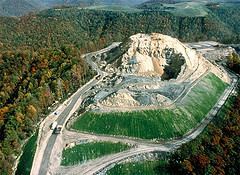 The rules had required environmental impact studies and reviews prior to permitting the coal companies to blast the tops off ancient mountains and using the debris to fill in valleys, a practice that destroys mountain feeder streams, diminishes supply and pollutes the water supplies for towns and cities downstream. An excellent overview of the situation and local efforts to stem the tide of destruction can be found in this diary by Bruce Nilles on the political website Daily Kos. One of the mountains immediately threatened by this ruling is Coal River Mountain, one of the last mountains still standing in West Virginia’s Coal River Valley. A local coalition, Coal River Wind Farm has developed an excellent alternative to destroying the mountain and watershed that will return economic value to the area, jobs to the residents and power to the grid all at the same time. Do check them out and lend your voice to their efforts to convince WV state officials to choose alternatives to King Coal and the filth he leaves in his wake. A new campaign is currently in the works between the Waterkeeper Alliance and environmental activist Robert F. Kennedy, Jr. to fight the ongoing destruction of Mountaintop Removal, to be called “The Dirty Lie.” Stay tuned for links and information here as soon as the website’s up and going. North Carolina, Feb. 14: Meanwhile, efforts by environmentalists in North Carolina have been targeting the mighty behemoth Duke Energy and its CEO James Rogers to protest the building of yet another coal-fired power plant in the mountainous southwestern part of the state.Anti-coal activists in NC have also been holding the line in the state legislature against the purchase and burning of coal from Mountaintop Removal in any of the state’s coal-fired power plants and industries. The proposed restrictions were shelved again in the last session, but supporters are active to get a positive vote this year. Environmentalists in Georgia have introduced similar legislation to ban coal from this source, and in Ohio has suspended the building of new coal plants altogether. So progress is being made even though Old King Coal is still trying as hard as he ever did to turn the whole world black. So stay tuned, concerned lovers of the land, we’ll be seeing a lot more about these battles in the near future, and all of them will need our support! Is America Ready to Quit Coal? Georgia to Ban Mountaintop Removal Coal?